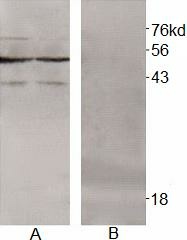 This rabbit polyclonal antibody is specifically isolated and affinity purified from the anti-serum using chemically methylated protein antigen. The affinity purified trimethylated lysine antibodies are affinity absorbed with N-(epsilon) mono- and di-methylated lysine. The antibodies could be utilized for detection and quantization of proteins with N-trimethylated lysine residues. Recognizes proteins with trimethylation on lysine residues (N-epsilon); antibody does not cross react with acetylated proteins or mono- and dimethylated proteins. In the biosynthetic pathway of 1-carnitine, epsilon-N-trimethyllysine hydroxylase is the first enzyme that catalyzes the formation of beta-hydroxy-N-epsilon-trimethyllysine from epsilon-N-trimethyllysine. This reaction is dependent on alpha ketoglutarate, Fe2+, and oxygen. 5. J. Proteom. 2015, 15: 2166–2176. doi: 10.1074/jbc.M114.605527.